After the ill-fated sojourn to Koji BBQ Buffet, I was in need of some good Korean BBQ to wash the bad taste out of my mouth. 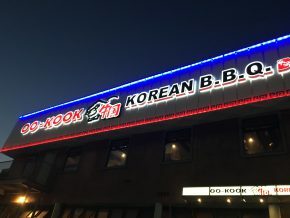 Fortunately, my friends were more than willing to join me and we ended up at Star BBQ in Koreatown, partly because we had heard great things, but also because it was the easiest place to pronounce. Upon arrival the place was empty, which meant we got personal service that meant not only faster meat, but a waitress to help us with the cooking of it.